Surf Garment Template Flatbed Cutting Machine is developed to meet garment template making require, it could routing on acrylic or foam board at high speed, high accuracy, thus it could save labor cost and improve the working efficiency. Also it is free of smelly harmful waste air and cost less compared with traditional laser cutting machine. The STA series cutting machine have double functions of cutting and drawing to make both paper board pattern and PVC template. Currently this machine is widely used in apparel industry to do acrylic or foam garment pattern cutting. 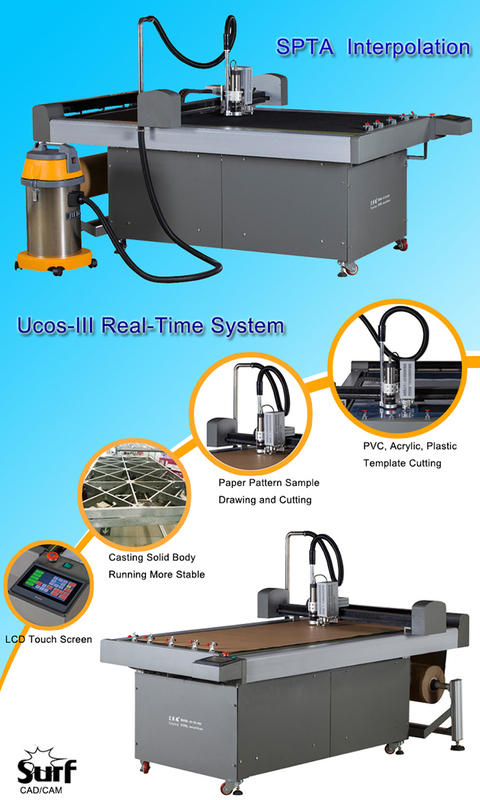 Surf Computerized Template Cutting Machine is widely used in making template for garment, sofa, cases, shoes, cap and gloves etc. Cutting PVC board, acrylic sheet, plastic plate and other hard materials. 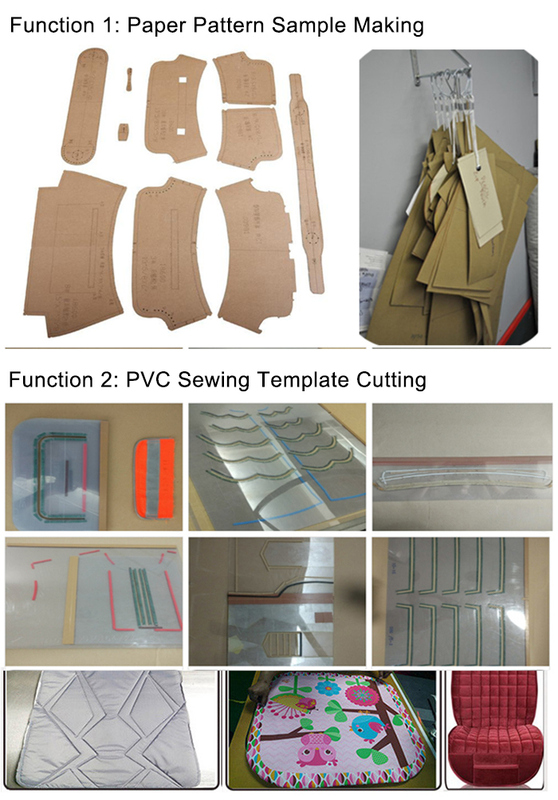 Can cut material (less 5mm):Â brown paper, white paperboard, wrapping paper, yellow cardboard, red cardboard, PVC board. plastic board and fibred board etc..
Any CAD format can be connected. High speed, Precision, Stable operation. Powerful R&D Team with overÂ Â 10 yearsÂ experience in program and control system on Inkjet plotter & Cutting Machines,Â and most Inkjet plotter suppliers adopt our control system. 100% strict test of high temperature aging without fault by 7*24Â hours before packing. 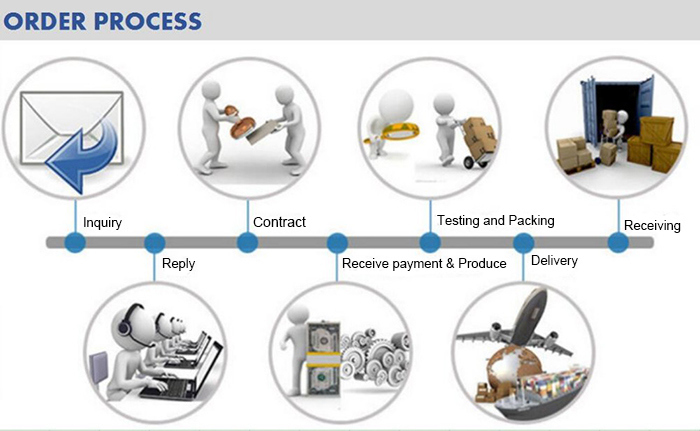 All raw materials are supplied from strict control channel. All our suppliers are high reputationÂ Â companies in China. We build long and stable cooperation relationship with them. In case of any quality problem, it can be easily be tracked. All control systems are 100% developed by our own, which are of absolutely advantage compared with other suppliers. Their strong stability ensure the machine running steadily and durably. 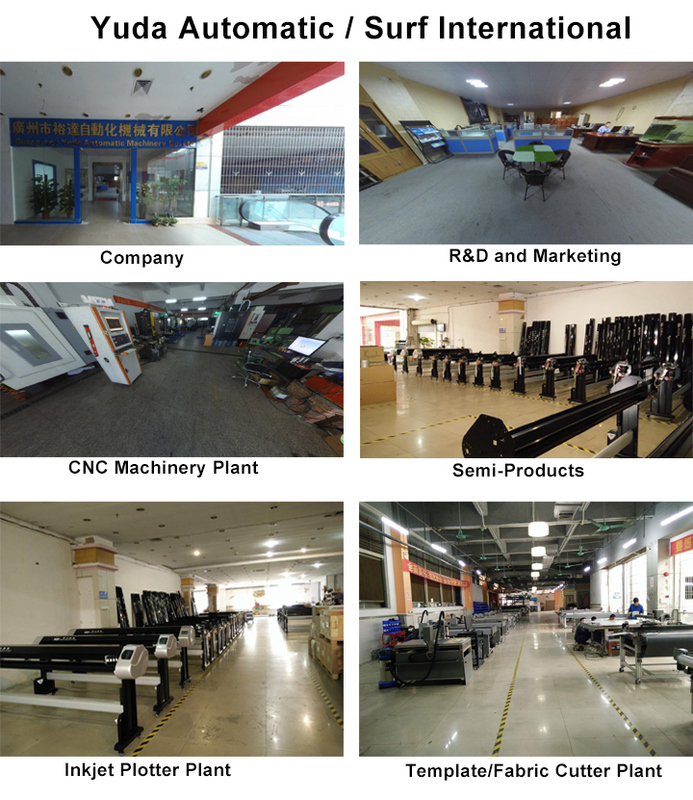 We have our own machining plant and all of our workers are well trained with more than 3 years skilled industryÂ experiences. Upon these the deliveryÂ Â time and quality are ensured. Â International standard plywood case, Â custom suffocatingÂ free. Q1.How to get the most suitable machine and best price? Yes, we will, if you come to China, we will offer you free training until you can use machine freely. Q3.How about your after-sales service? We supply 12 months warranty for the whole machine (except for consumables & man made damages)and Â 24 hours serviceÂ by phone, Skype, WhatsAppÂ orÂ Wechat. complete machine will be tested to make sure they can workÂ Â very well before being out of factory. The testing video and pictures will be available before delivery.